A lot of little stories (and a LOT of snow falling here at the Mobile Writing on the Mall News Center) lead to today’s quick hits! The Etta Express can at least find something positive now that the baseball season is over: being ranked 19th in an end-of-season poll of NCAA Division Three baseball teams. The Pioneers, who had been ranked as high as 13th in that nation, hadn’t seen the Top 25 since dropping out in week nine. D3baseball.com runs the poll, with a 25-member panel made up of coaches, sports information directors, and media from across the country. Marietta made a strong run through the Mideast Regional, making it to the regional final against Wooster. Though the Pioneers lost the OAC automatic bid to Heidelberg, they were ranked third in their region after receiving an open bid. Wooster went on to lose in the Championship game to the University of St. Thomas, but finished ranked second in the nation. Heidelberg finished 14th in the nation. The Marietta Pioneers bring a whoopin’ upon Adrian College, with a 14-3 victory. MC moves on to the second day of games to face Wooster, who beat Concordia (Ill.) 5-1. Â Heidelberg, Concordia (Ill.), and Adrian now face elimination with another loss. Â Heidelberg will play Concordia (Ill.), while Rose-Hulman will play Adrian. You can listen for the Pioneers from the Online Stream starting at 5 PM Friday. Â Depending on who is eliminated tomorrow, there are several different ways of how Saturday’s games will come together. Â After Friday’s games, I will post when Marietta plays next. Games are underway in the Mideast Region today. With the rain gone, game one was played, showing us that the underdogs are here to play. Rose-Hulman beat Heidelberg 12-2. Wooster and Concordia (Ill.) are currently playing, and Marietta will play the home team, Adrian College, at 4PM. After falling to Heidelberg in the OAC tournament, Marietta College received an at-large bid for the Division 3 Baseball Tournament. Â This is the 34th time the Pioneers will be in the post-season in baseball. Playing tonight at #4 Adrian College (Start time of 6:50 PM), the #3 Marietta Pioneers will begin the march into what is hopefully a long post-season. Â While the Pioneers were unranked for most of the season nationally (they did finish with 10 votes, effectively making them the 35th best team in the nation), they finished with a ranking of 4th in the Mideast Region (but seeded third). 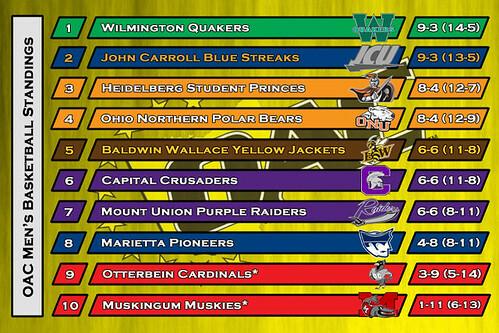 Â Comparitively, the other OAC team in the tournament (Heidelberg) was ranked #4 in the nation, #1 in the region. Adrian College was not ranked nationally, but was ranked 6th in the Mideast Region (receiving a #4 seed for the tournament). The Mideat Region plays in Adrian, Michigan this year, and like the rest of Division 3, features a Double-eliminationÂ format. If Marietta wins tonight’s game, they will play Thursday at 7 PM against the winner of the Wooster/Concordia (Ill.) match-up. Â If MC loses, they play at 3:30 PM tomorrow against the winner of the Heidelberg/Rose-Hulman match-up. Â Past that, the tournament gets much more cloudy. Â But I’ll keep you updated as the tournament progresses. D3Baseball.com is looking at Heidelberg to advance, but sees Adrian as a possible upset special for the second year in a row. Â Hopefully Marietta can put something together here in the post-season. All Marietta College games can be heard tonight anywhere in the world thanks to an online stream off of the Marietta Athletics site. Â There would be two streams if school was still in session, but oh well.